Home Society Human Rights Hang in there, TalCual! 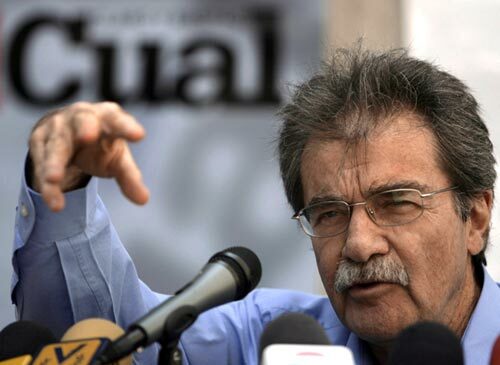 TalCual editor Teodoro Petkoff, currently charged by a local court of defamation against Diosdado Cabello. After 15 years, Caracas newspaper TalCual will stop publishing its daily edition on February 27th. In a written statement, the paper confirmed the bad news (leaked earlier by some of its columnists) but insists that they’ll try to continue as a weekly publication and through its website. But the statement also leaves clear who they hold accountable for this shutdown: the central government. According to TalCual, there has been “systematic harassment” against them by the State, done in several ways: lawsuits, constant inspections and procedures by different ministries and agencies, and pressure against their advertisers. TalCual has had a very contentious relationship with the government: Some of its editorials were called “disrespectful”, and some of their columnists went to court as well. Even its main cartoonist Roberto Weil faced controversies of his own. The turning point came in March of last year: National Assembly President Diosdado Cabello filed a lawsuit against both Tal Cual and former Minister Carlos Genatios for “defamation”, regarding an opinion piece written by Genatios in which he misquoted Cabello. The mistake was done by a third party (news website Noticiero Digital) and both ND and Tal Cual apologized for it. But Cabello didn’t back down, the lawsuit was admitted, and now editor Teodoro Petkoff and other board members must show up in court every week. Genatios eventually left the country. TalCual mentions this case in its statement, and warns that if they are found guilty, the paper would face a hefty fine and all those charged could end up in prison for several years, thanks to a very controversial part of our Penal Code. The case of TalCual is basically the living example of the hegemon’s way: If they can’t own it, then they will break it. And it’s only part of a larger and darker strategy, denounced this week by the National Journalists Association (CNP). We here at Caracas Chronicles have been fans of Tal Cual, and Teodoro, ever since we began, so we are deeply saddened by these news. I would like the chance to offer my full solidarity to TalCual’s staff, and my hope is that this doesn’t really mean the end.